Frames are definitely back. More and more Web apps like the Diggbar are using frames to overlay a thin toolbar on top of other Websites, and the practice is causing some controversy because frames are generally frowned upon as messy Web design. 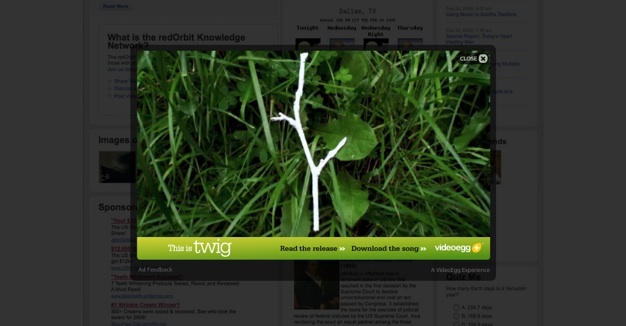 Today, VideoEgg is introducing a new ad unit called the Twig, which looks like a toolbar either at the top or bottom of a Web page. 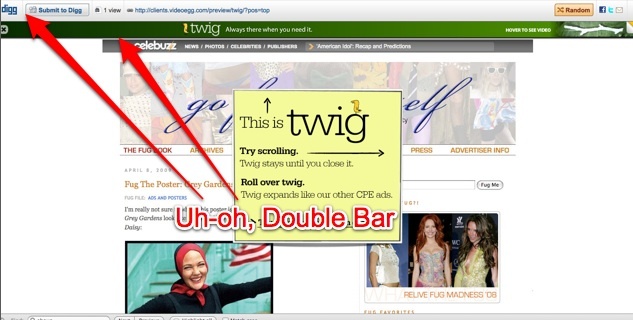 The Twig ad bar frames the site and is always visible no matter how far a reader scrolls down the page. When you click on the bar, you get a three-second warning before a VideoEgg ad takes over the whole page as an overlay. You can see a preview of how it works here. Twig is designed for blogs an other sites with comments and other elements that create long pages and cause readers to scroll down past the regular ad units normally on the side. The ads that appear after you click can be any of a variety of video or other interactive ads that VideoEgg specializes in. The Twig ad bar itself is similar to an increasingly common ad unit in videos: an overlay bar along the bottom that you click on to see the full ad. I like the fact that VideoEgg is taking something that seems to be working in video ads and bringing it over to regular Websites. And the Twig ad bar is certainly preferable to those annoying ad units you see on some major news sites that pop up in the middle of the page and move down as you scroll, blocking what you are trying to read. (Note to advertisers: those floating ads do nothing but make me associate my feelings of anger with your brand). The thin bar at the top or bottom is unobtrusive enough and opt-in. And since it will be the sites themselves rather than a third party app imposing the frame, it probably won’t raise as many objections as something like the Diggbar. After all, as a pervasive ad unit it is not so bad.